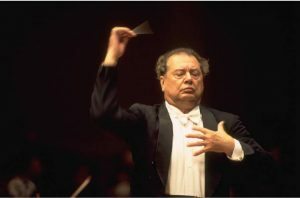 Rafael Fruhbeck de Burgos scheduled to conduct at Tanglewood August 2012. The Boston Pops conducted by Keith Lockhart in a program of George Gershwin and the Great American Songbook begin the final weekend of Tanglewood’s 2012 season Friday, August 24. This Gershwin and Friends program will feature Broadway favorites Maureen McGovern and Brian Stokes Mitchell, as well as pianist Ilya Yakushev, who will perform Rhapsody in Blue. Tanglewood’s annual Family Concert, featuring Classical Tangent, a group made up in part of BSO players who perform many different styles of folk music for classical audiences, will take place at 2:30 p.m. on August 25. On Saturday, August 25, Rafael Frühbeck de Burgos presides over a program of music from his native Spain. The concert begins with Maestro Frühbeck’s own arrangement of Albéniz’s Suite española, but the main event is a complete concert performance of Manuel de Falla’s La vida breve (Life is Short), an opera about the doomed love of a gypsy woman for an upper-class man, complete with Flamenco dancing and a Spanish folk singer, a program first performed under Maestro Frühbeck in 2003. The two lead roles are sung by mezzo-soprano Nancy Fabiola Herrera and tenor Vicente Ombuena. The 2012 Tanglewood season comes to a close with its traditional performance of Beethoven’s transcendent Symphony No. 9, on Sunday, August 26. The big finale will be preceded this year by the world premiere of a BSO-commissioned new work by John Harbison. Vocal soloists for Beethoven’s Ninth are soprano Leah Crocetto, mezzo-soprano Meredith Arwady, tenor Frank Lopardo, and bass-baritone John Relyea.